We pride ourselves on providing only high quality products for you to enjoy! Full case is 12/12ct. packages. These are one of the 2 most common household use wraps we make at 10" accross. There are 2 delicious flavors to choose from. These are great for placing your favorite filling in them and rolling up to enjoy. As with all Father Sam's products, only the finest ingredients are included when making our quality flour tortillas and flavored Wraps. Tortilla and Wrap sandwiches are sweeping the nation. 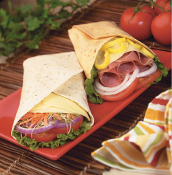 Simply place you favorite sandwich fixings to the center of the wrap and roll it into a wrap sandwich. Copyright © 2012-2019 The Bakehouse Market. All rights reserved.